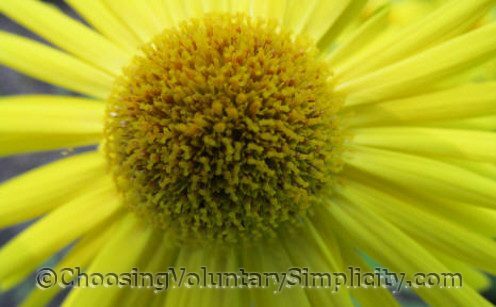 Leopard’s bane (Doronicum orientale) is a flowering perennial that has been growing in gardens for hundreds of years. This plant has a long history that goes all the way back to the woodlands and meadows of Eurasia. 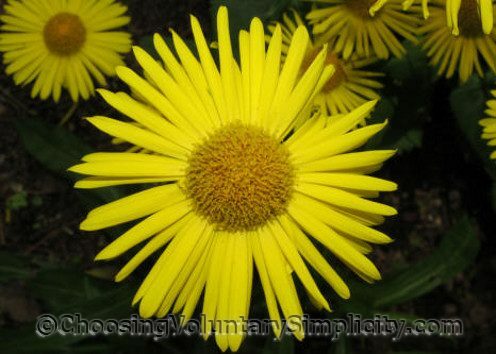 There are thirty-five species of Doronicum, but only a few of those are available in today’s nurseries. I have the cultivars ‘Magnificum’ and ‘Finesse.’ They look very much alike. Magnificum has fewer petals and slightly wider petals and a darker center. Finesse’s petals are slightly narrower with a tendency to curl under a little at the tips, and it has a center ball that is almost the same color as its petals. 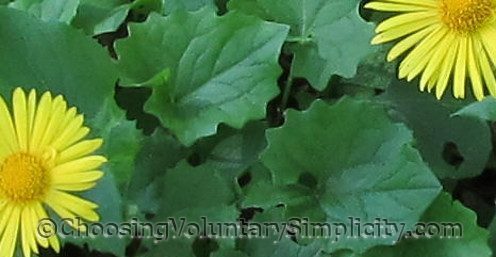 The leaves are fairly large and heart-shaped with jagged edges and an opening at the stem that at a quick glance can look like a piece of the leaf is missing. Leopard’s bane actually prefers cooler summer weather and especially cool night temperatures, so it grows very well here. Like most plants, it grows best in rich, organic soil. It likes partial shade and needs to have a lot of moisture because of its shallow roots. Leopard’s bane is one of the first perennials to bloom here in the spring. The daisy-like flowers don’t last very long, probably only a couple of weeks. Both of my leopard’s bane (Magnificum and Finesse) have a single row of narrow petals, but some cultivars have flowers with double or semi-double petals. I have seen the flowers described as showy, although they have always seemed rather plain to me. They measure approximately two inches across and are the exact same bright yellow as the dandelion blossoms growing so abundantly (and at the same time) in our meadow. Aside from the welcome spring color, the thing I like best about leopard’s bane is that it stays where I put it. The plants do take up a good bit of real estate in my garden (a mature clump of leopard’s bane will be at least two feet tall) but unlike most of my other perennials, it is not at all invasive. Deer and other animals will not damage this plant because all parts of it are toxic. 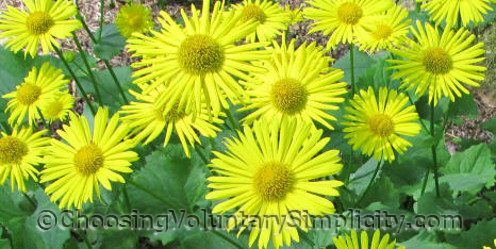 Leopard’s bane is a very easy, no-fuss perennial. Gardening books advise digging and dividing leopard’s bane every three to four years. I’m a few years behind in dividing mine… but they don’t seem to mind. I live on the southside of Chicago. Can you recommend colorful perennials that will do well in clay soil and do not need a lot of water. The location I have in mind only gets partial sun. 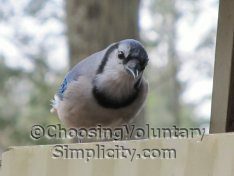 I don’t have any experience with growing flowers in clay soil, but your local garden center or the Extension Service should be able to give you recommendations for perennials that will grow well in your area and in partial sun. I especially like foxgloves and hollyhocks and the other perennials I have written about in this blog, and if you check the articles on individual perennials, I usually tell what kind of soil and growing conditions they prefer. Once again, beautiful flowers and beautiful photos! Your gardens must be incredibly goregous. Thanks for all the information and stories. I do love your blog. I just bought leopards bane last night. Mine is in a tiny little pot and doesn’t have any flowers so I did a search for leopards bane and found your sight. I can’t wait until my wee plant looks like your’s. Thank you for the great photo’s and information. Beautiful!!! Beautiful!!!!!! Beautiful!!!!!!!!! Yellow and esp. a bright yellow like that is my favourite colour!!!!!! I’m going to try this plant. Do you think it will do well in a semi shaded spot where I have astilbe and hostas? The yellow would be a nice contrast, I think, to an otherwise cool pinks, purples and white. I love the leaves of this plant! And the flowers look like they would be good for pressing. I like to press flowers and add them to pages of books that I know my grandchildren will read someday. My Mum did that and I often open a book and there she is in a leaf or flower. Nice memories. I have never commented on a website or blog. I would just like to thank you for sharing these wonderful ideas with me and so many others. I find myself going to this sight at least once a day if not more if I can squeeze time. I have been trying to accomplish the things your speaking of for some time now. I find the older I am the more simple I want to become. I’m not concerned with the trappings of things that just seem a waste of time. I’m fond of doronicum. The yellow “eyes” of this plant gave me in May so much warm.